In time when space is prohibitive and mobility is an advantage which allows us to search for the ideal place, the Foodtruck concept has become a trend in the world of restaurants, allowing quality of raw materials, quality of preparation and the work of great chefs in a smaller space. 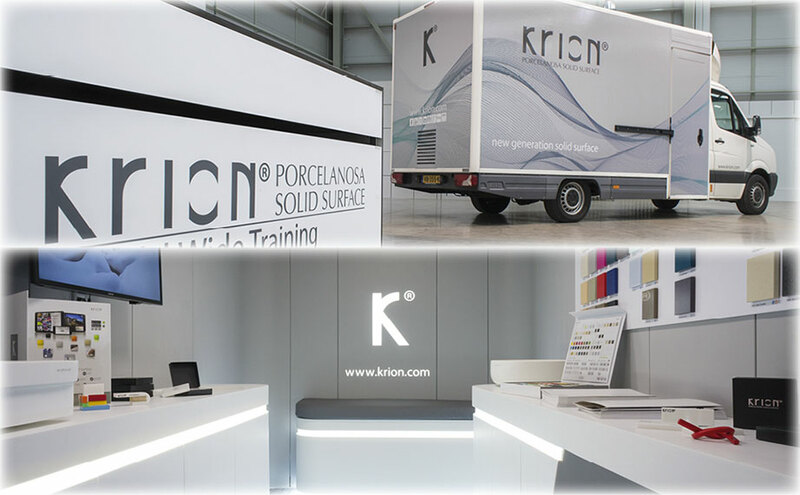 These are the concepts that the compact mineral from PORCELANOSA Group has wished to encompass in our KRION®TRUCK; quality in our raw materials, new generation solid surface and results suitable for all sectors. All of this is presented in a small space which can bring our material KRION® to people. This initiative was created by Porcelanosa Holanda and RET Bouwproducten in order to bring KRION® to the largest number of people possible. The presentations are carried out in two phases: a presentation to architects, designers, decorators; and secondly aimed at professionals in transformation, carpenters, stonemasons, etc. At the start of its journey it has travelled to the main cities of the Netherlands, Rotterdam, Eindhoven, Amsterdam, and Maastrich; and this is just the beginning. We hope to continue the journey, presenting our company and our material KRION® to all those who wish to discover it.